On a gorgeous spring morning in early May, Chelsea Investment celebrated a very proud moment with the official ground breaking of Duetta and Volta. 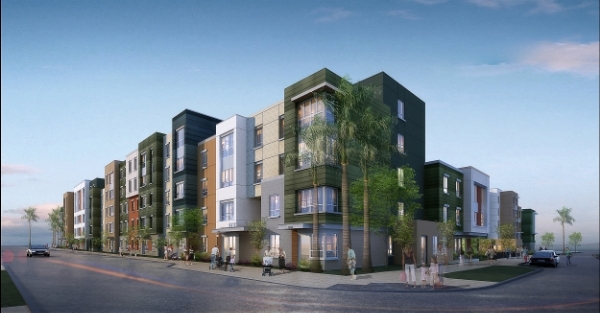 With two separate towers, a senior tower and family tower, Chelsea Investment will deliver a 210 unit affordable rental community in Chula Vista's Millenia project. Millenia is envisioned as a future city center for South San Diego, with up to 3,000 multi-family residences, 2 million square feet of office space, 1.5 million square feet of retail space, six themed urban parks and a variety of tree-lined promenades, casual gathering places and plazas. Population at build out will be approximately 7,500. Discover your destination at Duetta Apartment Homes. Featuring spacious one-, two- and three-bedroom units for qualified households, Duetta’s location within the brand new Millenia master-planned community provides convenient access to a multitude of recreation, entertainment and dining options. Whether you’re staying close to home or experiencing everything San Diego has to offer, make the most of your time at Duetta. At Volta, enjoy the best Otay Ranch has to offer without compromising comfort or convenience. Situated within the innovative Millenia village, Volta puts dining, shopping, and transportation at your doorstep. Designed with energy-efficient features and stylish interiors, Volta offers one- and two-bedroom apartment homes for qualified senior households. Live at the center of it all at Volta. It’s always great to be part of a new community and we’re honored to be building just down the street from our friends at Shea Homes San Diego. Shea is now building two innovative urban neighborhoods, including Element at Millenia (70 single family homes) and Z at Millenia (106 attached residential condominiums). Follow Millenia's progress by clicking here. A big thanks to Meridian and their partners at Stratford who allocated this valuable piece of land and are committed to creating the critical infrastructure necessary for the feasibility of this project.